My grandpa once asked me when to start picking fruit from his Hass avocado tree. I said February. But it’s true that I’ve been picking one every now and then from my Hass tree since November. They’ve tasted acceptable, but I know that from February they’ll taste good, so I said February. Further, from March or April they’ll taste wonderful. There is no simple or correct answer to my grandpa’s question. 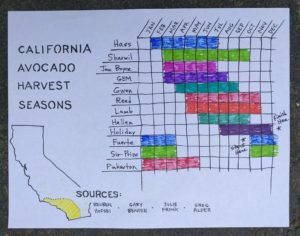 That said, if you know which kind of avocado tree you have, then there are reference charts you can use to give you a general sense of a variety’s harvest season. One such chart is this one by Julie Frink, based on observations in Irvine, Orange County, California. It shows the eating seasons of 27 avocado varieties. Below is a chart that I made based on experiences with trees in my own yard in San Diego County. In making the chart I also took into consideration other avocado trees I know in other parts of Southern California, as well as the experiences of other people, including Mrs. Frink. But the chart only shows avocado varieties that I actually grow in my yard, just to try to make it as reliable as possible. Fuerte is the fastest avocado on the chart to mature, about nine months after flowering, so I wrote *Start here. Holiday is the slowest. After flowering, Holiday fruits take almost a year and a half of growing time until they’re mature and ready for picking, so I wrote “Finish here. All of the sources I used for this chart are from Southern California, but you should know that even they (we) slightly disagree. I chose to color in the months where almost everyone agrees that a particular variety tastes not just okay but good. I didn’t color in January for Hass, for example, because even though Hass can taste satisfactory that early, no one thinks it tastes good until at least February. Just keep in mind that any chart is going to be general. When fruit from your tree will taste best to you might be on the front end or back end of the months listed. Also keep in mind that it’s slightly warmer the farther south you go in California, so if you live in San Diego your avocados will mature a little earlier in the year than if you live in Santa Barbara. I have picked good-tasting fruit from a Hass tree in Carpinteria in November — not the first November, but the second November. In other words, the tree had bloomed in perhaps February and the little fruitlet began to grow, and then it hung on the tree for almost two years after that. When I picked it, the fruit was totally black. But it was still totally delicious. 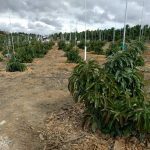 You might also be interested in knowing that the California Department of Food and Agriculture’s Avocado Inspection Program controls when commercial farmers can pick and sell their fruit. They issue maturity release dates each year. You can view the 2018-2019 dates here. These dates can be used by us backyard growers as guides for when to harvest. For example, the CDFA program allows the picking of the biggest Fuerte fruit starting on October 27, and then big Hass fruit one month later on November 28, while big Lamb fruit can’t be picked until May 8. (Small fruit is always released for picking at later dates compared to big fruit.) This gives us an idea of the order of maturity and harvests of different varieties, as well as the amount of time between the seasons of each variety; for example, the Lamb season starts more than six months after the Fuerte season. 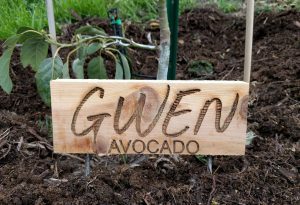 Here’s a list of some avocado varieties grown in Southern California in their approximate order of harvest, starting from the earliest to the latest: Stewart, Bacon, Fuerte, Zutano, Sir-Prize, Pinkerton, Hass, Sharwil, Jan Boyce, GEM, Gwen, Reed, Lamb, Nabal, Hellen, Holiday. But what if you don’t know which kind of avocado tree you’re picking from. My mom has a seedling avocado tree in her backyard, and some years back we had to figure out when to pick its fruit. Also some years ago, a friend of mine moved into a house that was shaded by an enormous old avocado tree with large round fruit that had shell-like skin but whose varietal name no one told him. Through trial and error, we figured out when to eat that tree’s fruit (and we later concluded that the tree was an old variety called Nabal). Pick the biggest fruit on the tree and see how it ripens. Be patient. Ripening (the softening of the flesh inside) sometimes only takes a couple days but can take a couple weeks. If the skin shrivels or if the fruit never softens beyond a rubbery texture, then it’s immature. Wait about a month to pick and test another big fruit. If the fruit has hard skin like a shell (e.g. the varieties of Reed and Nabal), you may want to pop the stem off and stick a toothpick in to judge whether the flesh is softening. If the fruit ripens nicely but when you cut it open the flesh is dark yellow, tastes overly rich, even smelling near rancid, then you’re too late. Next year, start picking about six months earlier. In other words, if you pick one that’s too mature in July, then try picking the next crop starting in January. By the way, if you want to try to figure out which kind of avocado tree you are picking from, use the maturity season that you discover and refer to one of the charts above in order to get names of possibilities. For example, if it tastes good in the summer then that eliminates Bacon, Pinkerton, and Fuerte, but it leaves as possibilities Hass, Reed, and Lamb. Then search for those names on the U.C. Riverside Avocado Variety List to see if one fits the description of your fruit and tree. This is better than doing a general web search because unfortunately, a lot of what you’ll find on, say, Google Images is mislabeled. No matter what, mark your impressions of the fruit you pick on a calendar so you don’t have to keep dates in your busy mind. Or, what I often do is associate a harvest season with a holiday or birthday. For example, Holiday avocados are named Holiday because they taste good from Labor Day through New Year’s. Bacons can be picked starting on Halloween and taste best on Christmas. 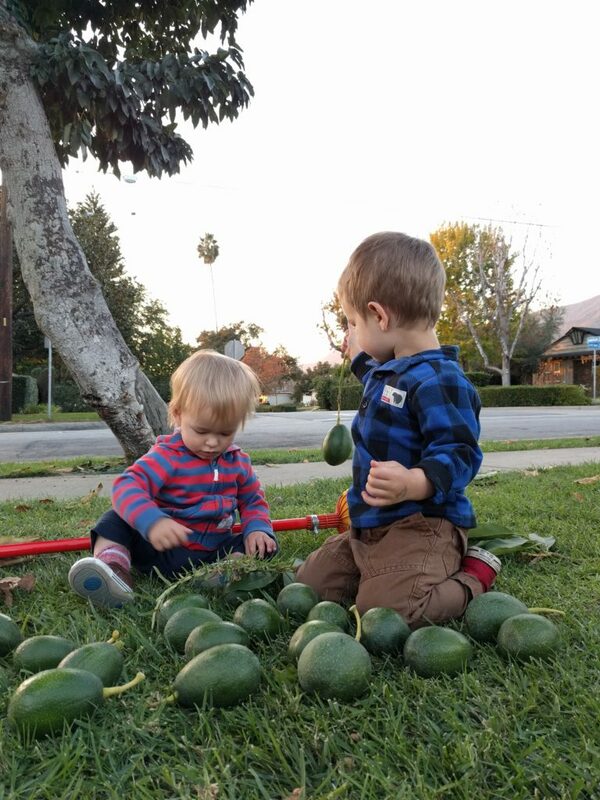 My boys helping with the Bacon avocado harvest. Can you grow an avocado tree in a small yard space? I’ve been enjoying some of my avocados lately. Its very satisfying to pick them, let them ripen, the savor the deliciousness!! I might be able to identify your avocados. Send a picture. But picking times in Florida are different than Southern California where I am. Your best bet to get good information on that is at tropicalfruitforum.com. Many knowledgeable avocado growers from Florida participate in the discussion threads there. Best of luck! Question about the Holiday. Planted in 2014, this is the first year it is bearing fruit. Noticed tiny fruit in May and now they seem to be full grown in size (they are huge). I picked one about a month ago but it never seemed to ripen. I cut into it and the flesh looked perfect but just wasn’t soft. As I mentioned in my other post, I picked a few today that were getting sunburn and we’ll see how they ripen. Back to my question, if it takes 1.5 years to have full size fruit, am I still way off from maturity? It was my understanding that the they ripen Labor Day to NYD hence “Holiday”. I read somewhere else that they only fruit every other year due to their growing cycle. Does that mean I won’t get fruit next year? Would love to get some clarification as it didn’t fruit a lot this year so I want to take full advantage. Thanks! Gretchen, stop! Back away from your Holiday! Yes, it’s strange but true that the Holiday sets fruit around May but won’t be ready to eat until the following year. 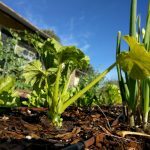 So yours will likely start tasting good at the end of summer 2018. You’re not alone in picking Holidays early. Because they get so big, and they get big long before they’re actually mature, many people make this mistake. This coming spring, 2018, your Holiday tree will bloom again and set its second crop of fruit. 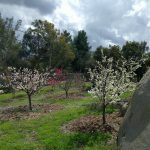 So when you start eating the first crop at the end of summer, there will also be a second crop on the tree, growing, maturing, ready to be eaten at the end of summer 2019. It’s not entirely accurate when people say that some varieties of avocado trees produce fruit every other year — also called “alternate bearing.” This can happen, and some varieties are more prone to it than others, but it would be more generally true to say that avocado trees often have heavy crops followed by light crops. It would be even truer to simply say that every year’s different. But as regards the Holiday in particular, of the Holiday trees that I know, I’ve never noticed them to be especially prone to alternate bearing. Hi again Greg! Unfortunately the squirrels got most of my initial Holiday crop so I grabbed the last one off the tree last week. It seems to be soft but is more of a dark green v. the nearly black of a lot of avocados. Is that normal? Sorry to hear about the squirrels getting your fruit. Yes, it’s normal for Holiday avocados to remain green when they’re mature and soft and ready to eat. They’ll never turn black. Thank you. The one that I did get was beautiful! Sad it is only one. If you have any tips on how to deal with the squirrels without resorting to poison, I would appreciate it! About squirrels, I wish I had a perfect solution but I haven’t found one. While I don’t use poisons, I do kill them. I hate to do it, but I know of no other way than to trap and shoot them. I wish there were a better way. Thanks for the great info and advices! We moved from Orange County to north San Diego County last October and the house has a big Hass tree. The Tree was (and still is) packed with avocados and we’ve been picking a little at a time (always trying to get the bigger ones) since November. We usually picked them green and wait for it to mature before eating. Rigt now the leaves are getting brown (tips) and starting to fall but the tree still has a ton of avocados in it. Just wondering if new Avocados will come even with the “old” ones still there? Also, a few of them are browning, does that mean its mature or “burned”? Lucky you, moving into a house with a big Hass tree in the yard. Everyone should be so lucky! Yes, the tree can set new fruit here in spring even while there’s mature fruit hanging on the tree. But Hass are tasting about their best right now (May) in San Diego County so don’t ration that fruit. If the fruit has brown spots, it’s possibly sunburn. Are the brown spots on the south or west sides of the fruit? If not, it could be from bugs called thrips, or a number of other things. Hi, I stumbled upon your website and wonder if you could spare a moment to share some wisdom. We live on a property with a mature Reed avocado tree in back. A few months ago, an old pepper tree in front died and was cut down. I am looking to replace it with another avocado tree. My reading has led me to consider a type B variety (to help cross pollinate the type A reed and yield fruit at a different time). I was initially thinking of Fuerte, but then read it does not bear fruit well near the coast and we live 1.5miles from the beach. No now I am leaning towards Bacon, but then read that the variety Hellen originated in Santa Monica which seems like a good choice except I’ve never heard of it before. Too much information! In any case, would you happen to have a recommendation for us living 1.5miles from the beach in Santa Monica, with a desire to add a pretty looking tree to the front yard and complement our existing Reed avocado?? – Thanks so much, John. Wisdom? Now I better give an awesome reply. To complement your Reed, I would go Hass as my first choice. Reasons being, Reeds produce well on their own without a B-type avocado nearby (as I’m guessing you already know), and Hass has a harvest season that is very different from Reed. Hass starts in winter and goes through spring and will likely even go through summer at your house so close to the ocean. Then Reed will take over sometime in summer and go through fall. Hass is an A type like Reed, but it also produces very well without a B type nearby. Fuerte is a possibility. Despite what is often stated elsewhere, I have seen Fuertes as close as you to the ocean that produce very well. But Fuerte is not as sure a producer as Hass, no doubt. Plus it has a shorter harvest season. Bacon is also a possibility, yet it has an even shorter harvest season than Fuerte. Bacons usually only taste good for about four months at the most. And they never taste quite as good as Fuerte or Hass. Their texture is great, but they don’t get so rich. 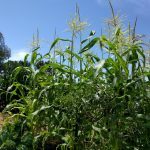 Hellen is an intriguing option since it first grew in your neighborhood. The only problem is that its harvest season is very similar to Reed. You wouldn’t want that. I have a huge fruit set on a young Pinkerton as well as a Haas that is 4 years old. Will the trees drop fruit or do I need to thin? My 20 year old Fuerte has a large set as well! 2019 is going to be a mighty good eating year at your house! They will certainly drop many. The fruit that is still holding in July will mostly hold to maturity. It’s unlikely you’ll need to thin your Hass, except maybe if the fruit is weighting the tree to one side. But if the Pinkerton is small, it may try to hold more fruit than it should. No harm in waiting until the fruit is at least the size of a golf ball to make that decision. Hi Greg, After reading your info on avocados, thought I would say something about Fuerte near the coast. I had a grafted Fuerte in my back garden no more than 100yards from the coast in Perth,West Australia. It grew very well even though it was planted in sand, probably ex sand dune sand. Perth is located on a sand plain derived from eroded limestone. In due time the tree bore fruit and I harvested over 100 large avocardo’s, all very good. I had no problems with the tree and it stayed there for years but I moved away. I now live on the other side of Australia in a semi tropical area north of Brisbane that is cursed with root rot and my only avo tree is a dwarf Hass Lamb in a large pot with it’s first 3 avo’s. Many thanks for your informative blog…..Rob. Thanks for sharing that. I look forward to visiting Australia someday. It has long interested me how the exchange of varieties between there and California continues. I’m growing a Sharwil and you’re growing a Lamb, for example. Hope those three fruit are delicious. the fruits that have fallen all weigh around 1.5-2lbs each. WOWZA!!!! Any advice or insight you can give regarding Holiday avos would be so greatly appreciated. p.s. on first taste, I prefer my Fuerte. Whats your opinion? It depends a bit on where you live, but much of your Holiday fruit might be ready for harvest right now in late June. We shouldn’t be married to the idea that Holiday fruit aren’t ready until they’ve spent 18 months on the tree, and remember that there are always flowers over the span of a couple months (therefore the maturity of each fruit might differ by a couple months). And definitely don’t rigidly follow my chart above, which shows the Holiday season as starting in August. That might not be accurate for your fruit in your yard this year. To wit, the fruit on my Reed tree is totally mature and tasting amazing right now in late June 2018. The chart, however, says Reed fruit has a harvest lasting through November. No chance of that this year! Not here. It’ll probably be rancid by September. Also, this Reed tree has been dropping fruit occasionally for the last month or so, just like your Holiday. Some trees seem to do this as a routine near the time of their harvest season. (Lamb is another variety like this.) It can be annoying, but I try to think of it as the tree telling me which fruit it wants me to eat. Unfortunately, sometimes it drops fruit that isn’t quite mature. I agree with you that Holiday doesn’t taste as good as Fuerte. Then again, what does? Fuerte is unsurpassed in flavor my opinion. But it’s possible that the rest of your Holiday fruit will hang into summer and their flavor will strengthen and you’ll like them more than you do now. Thanks so much for the reply. the info is greatly appreciated. We live in a pocket of San Diego, CA. Mediterranean climate. Tinkering with the idea of a third variety to round out the year in terms of harvest time. Thinking about it is fun, but finding room for everything is the issue. 🙂 looking forward to checking out the rest of your site. See the harvest chart in the post above for a general time frame on when to pick Holiday fruit, and remember that the fruit will be big for a long time before it will actually be mature and ripen and taste good. Holiday is deceptive like that. If the low branches don’t impede your watering (for example, from a mini-sprinkler), then no need to trim them. You can if you want to though. Holiday is unique in that it grows like a shrub instead of a tree, weeping along the ground. Hi! Just moved into a new home with a very big avocado tree in the backyard. I live in south Texas so our year is usually quite warm/hot. I’ve looked through the chart and have tried to identify the type of avocados I have but I’m still unsure. I’d love some help! Since different varieties of avocados are grown in south Texas than in California, I probably can’t identify your tree’s fruit. If I were you, I’d take a piece of fruit into a local nursery if possible. Maybe they’ll know the variety. If that doesn’t work, I’d go to tropicalfruitforum.com. There are growers in south Texas who participate and they can probably help if you post a photo. It’s also possible that it was a tree grown from seed, in which case it’s a unique variety and no one will be able to identify it. Then you can name it after yourself if you want! Trying to I.D. unknown Avocados. First slightly toast the avocado leaf. If you get a great odor you will know you have a Mexican variety. You can eliminate all the other varieties and hybrids from your list. p.s. 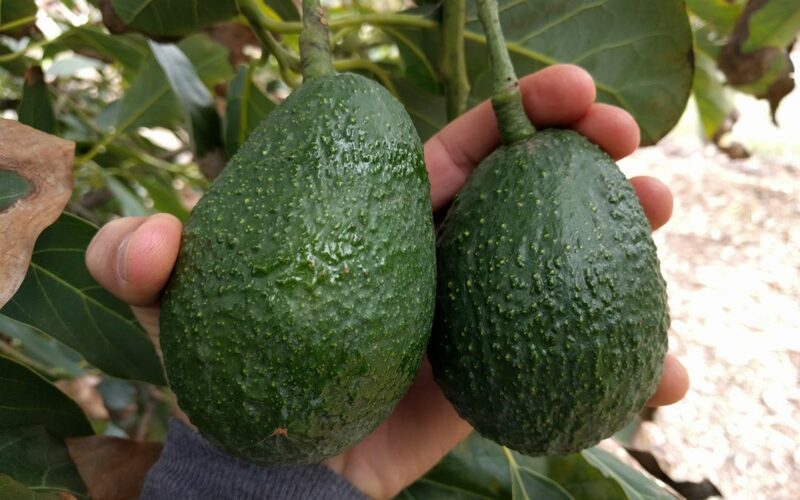 Take a look at Mexican avocado leaves for sale on the internet. When I last looked they were asking $6.00 for a 4 oz pack of dried leaves. That’s $24.00 a pound. FORGET THE Avocados… I’M GOING INTO THE LEAF BUSINESS.